Created by Gabrielle Roth, the 5Rhythms® is a conscious dance practice rooted in the principle that if you put the psyche in motion it will heal itself. The 5Rhythms are Flowing, Staccato, Chaos, Lyrical and Stillness. These Rhythms are a moving map to ecstasy that, when practiced, allow us to get grounded in our bodies, express our hearts and clear our minds so that our true essence can come forth effortlessly. In essence it is a dynamic moving meditation that nourishes mind, body and spirit! ● The 5Rhythms are Flowing, Staccato, Chaos, Lyrical and Stillness. These rhythms come together to create a Wave, which take shape in the form of music. There are 2 Waves in each class. ● The first Wave is a warm up, about 45 minutes, during which you are encouraged to let go of your day and drop into your body. The music is designed to help you warm up slowly in Flowing and Staccato. In Chaos, we reach a rhythmic peak, then in Lyrical and Stillness we mindfully settle down. ● In between Waves, Sayrah introduces a theme, which we explore individually, in partnership and in groups. ● You are ALWAYS at choice and should not do anything that makes you feel uncomfortable. ● NO TALKING on the dance floor and please keep our space drug and alcohol free. No street shoes. **Classes count as 2 hours of waves credit. 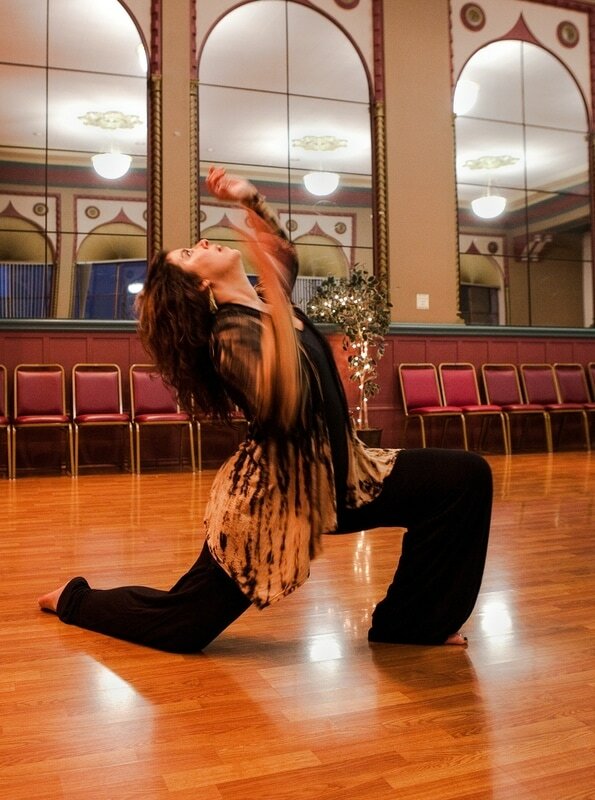 Sayrah Garrison is a certified 5Rhythms® teacher and has been teaching a weekly 5Rhythms class in Oakland for nearly 5 years. She is a Licensed Clinical Social Worker and also teaches yoga, meditation, and mindfulness to the general public and to special populations in need. She is deeply committed to exploring how these profound body based practices can affect positive change in all of us and hopes that her classes provide a fun way to explore creativity, connection and personal growth. Sayrah's life journey has taken her to more than 20 countries, and literally around the world. This experience has given her a deep appreciation for diversity, and a unique multicultural perspective. She welcomes students of all ages, races, gender & ability and is dedicated to creating a space that is safe and welcoming for all.